Conan Kickstarter’s Sabretooth Tiger | Azazel's Bitz Box. Today we have the Sabretooth Tiger from the Conan Kickstarter that I’ve previously painted both the Wolves and some barrels for. This one is very much a Neglected February model, as I started the bloody thing at the same time as I started those wolves. I finished those wolves over a year ago. I’d already done the orange-to-yellow-to-white shading, but somehow the need to sit down and properly do some realistic tiger stripes was a task that put me off completing it for so long. I used their official/box art for my guide, though I gave it more natural rear flanks and tail patterning than going really heavy on the dark stripes as in their art. Here’s the opposite side view. And alongside a couple of the Conan KS Wolves I mentioned earlier. As can be seen here compared to the Chaplain, it’s quite a decent sized beast. Not giant-animal sized, but certainly a solid, bulky creature. A Space Marine provides a much more relateable scale shot for many people. This entry was posted in Conan Boardgame and tagged Conan Boardgame, Conan Kickstarter. Bookmark the permalink. Thanks Alex! Yep, we have (had?) Tony here. Finishing it off makes me want to open another Conan box to see what else I can get painted up. Hopefully in less than a year, this time! Geez man he’s phenomenal!! Well done sir. Fantastic painting on the tiger! The fur is unreal! Huge respect for attempting something that intricate! If I can make one suggestion, though: I think picking up the yellow again on the fur underneath the mouth was a bit of a mistake: It makes the face look slightly indistinct (at least in the photos): I had to check back to the unpainted model to see what the mouth actually looks like. A quick Google research also makes it look like the fur underneath real tigers’ mouth is usually all white. 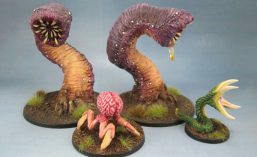 Apart from this one minor gripe, however: Truly outstanding work! I see what you’re saying, but I added the yellow/orange on the “beard” very late. Originally it was all white under the mouth with the black in the beard, but it looked too empty and plain. Even though the figure is pretty nice, the renders make the detail look a lot sharper (and about twice as detailed) as the actual figure is, and the mouth (and beard) details are very soft. But mostly it just looked too plain left white with a little shading. I had a hell of a time trying to get the camera to focus on the face given the orientation of the body as well, and wasn’t entirely successful, despite an extra trip back out to the light box 2 days after the first shots. I do appreciate the constructive criticism as always, though. 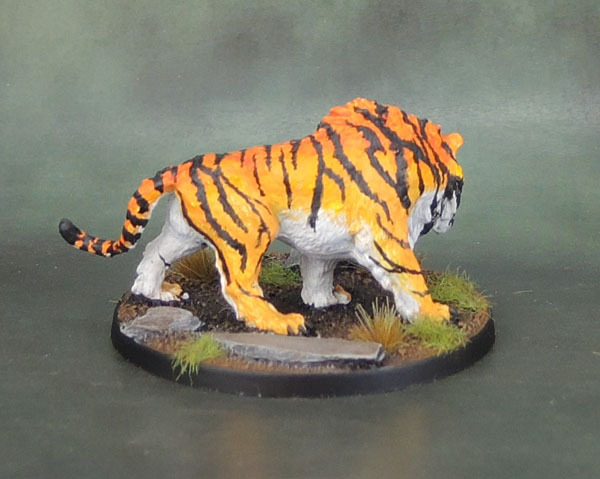 Oh yeah, and photographic tiger references are why I turned away from their concept art on the rear flanks and tail in the end and painted them like this instead. 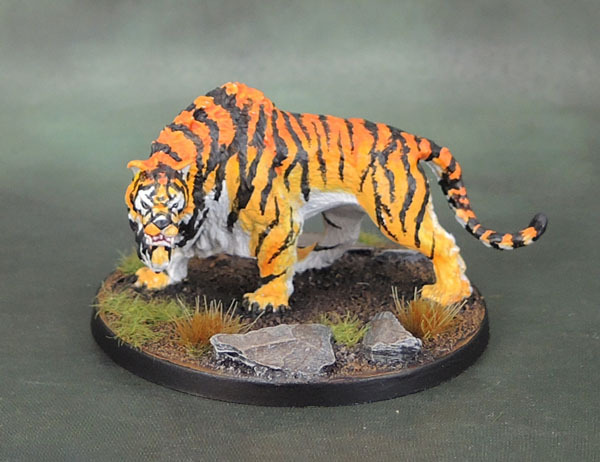 Their art looks great, but real tigers look even better – so I can’t complain about you using the real thing to point out issues with the paint! I like this a lot! Excellent stripes! My Tiger might feature in the next neglected model challenge, although it’ll have crosses and tactical numbers on the turret and won’t look half as good as yours! That is quite a good-sized cat. 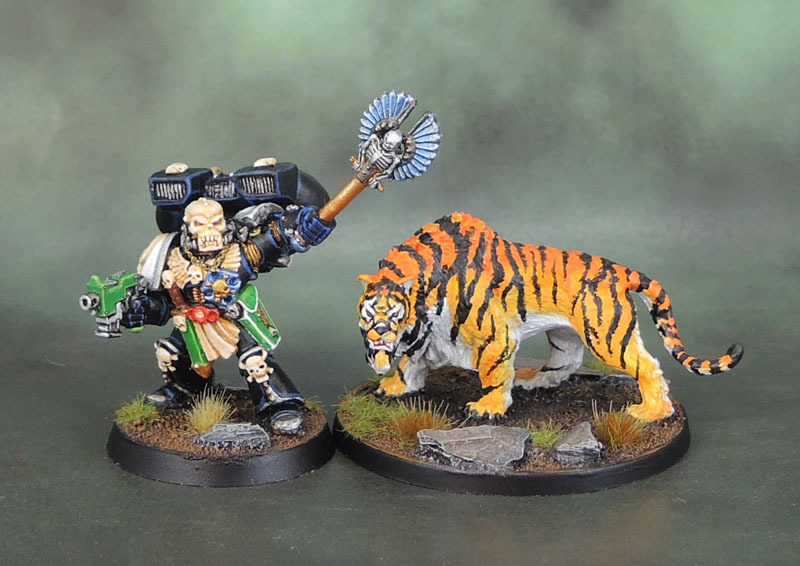 Seems about right for a male tiger compared to the wolves, but given the size of a space marine, I’d say he’s markedly bigger than a terran tiger, which is certainly fitting if he’s part of the world of Conan. I got a chance to play the Conan board game recently with a bunch of other people. I like cooperative board games in general and this one was no exception. I found the basics of the game easy to pick up and the mechanics weren’t clunky at all like is the case with a lot of older games. Yep, it’s a pretty cool tiger. The shoulders are very fantasy – more like a buffalo’s than a Tigers – and those definitely bulk the beast up. Good to hear about Conan as well – we might have to make it our next boardgame. After Pandemic Season 1 was awesome, Season 2 kinda fell flat, and then Zombicide Green Tide just piled on the extra mechanics (along with “goblin” runners that are too similar to the Orc walker models) so we didn’t get past setup the other night. We ended up just playing a couple of rounds of regular old Pandemic – which is still bloody awesome, even though we lost both – one barely and one we just got trashed! So Conan. Yeah, I think we may have to crack that one open. I found it to be worth it and pretty easy to pick up too. I’ve never played Pandemic, though I’d like to learn at some point. Pandemic is really, really good. My top co-op boardgame ever, I have to say. I like (most of the) Zombicide stuff a lot, but Pandemic is just …well, it’s considered one of the best for a good reason. I love your color scheme, very well done! Oranges and yellows are very difficult and you really pulled this off. Technically, how did you approach the stripes? Impressive! Just thin paint (Vallejo Black Airbrush primer) carefully delivered via a fine brush (Windsor & Newton Series 7, 000). I used a print out of the original artwork as my initial reference, then photos of actual tigers as the final references. Just took it really slow, and did each stripe on one side, then the other before moving to the next ones, in order to keep the patterning reasonably consistent. Did the stripes in a slightly feathered manner so it fit in better with the fur. Yea, having just painted a basic black beard…and being really careful about where that paint headed and where the brush tip was…I got the jitters thinking about painting black stripes over an orange and black coat. Kudos to you for pulling that off!